Learn about proper the leopard gecko habitat guide and how to properly setup your leopard gecko terrarium, leopard gecko vivarium, and proper leopard gecko setup. Before purchasing your new leopard gecko for sale, do your homework on proper leopard gecko care including habitat setups! 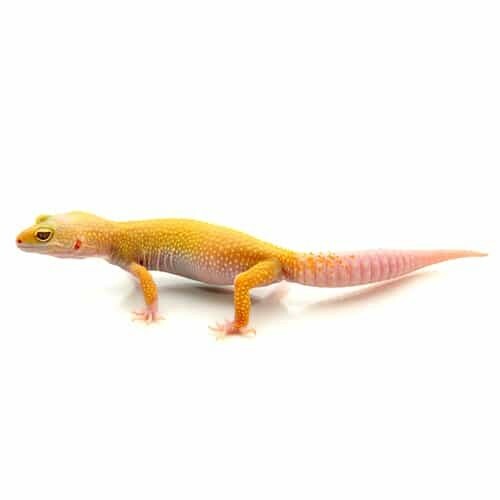 We have some really nice and discounted packages that contain everything you need to setup your leopard gecko properly. 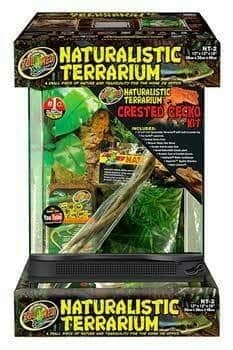 To view our leopard gecko habitat selection of leopard gecko terrariums and more, click here. 1. Leopard gecko Safety concerns: Using slate/ceramic tiles, there is zero impaction risk. Unlike sand and other loose substrate, tiles won’t get ingested by geckos. Too often people mistaken leopard geckos with other sand lizards. Leopard geckos are arid creatures, they do not live in sand, they actually live in rock crevices and burrows. So slate/ceramic tiles would feel more natural to them than sand substrate. Also make sure there is nothing too tall that can allow them to fall hard onto the ground. Leopard geckos do not have sticky pads on their toes (unlike crested geckos), so you want them to be able to reach down to the ground from the highest point of your decorations. Never design a cliff because they often will take the hard way down even if you have a ramp. Falling on their stomach, it could cause internal bleeding and possibly death. Those utilizing loose substrate such as Eco Earth Coconut Fiber throughout the whole tank should reconsider. Not only do they pose impaction risk, they will raise the humidity inside the tank above safety levels. High persistent humidity will cause upper respiratory infection in leopard geckos. Leopard geckos only require 20%-40% humidity. Coconut fiber should only be used within the moisthide, this way humidity is controlled, and it lessens the impaction risk because your gecko won’t be feeding inside the moisthide. So while we highly recommend Eco Earth coco fiber as moisthide substrate, we do not recommend using it as the general tank substrate throughout the whole tank. 2. Overall focus should be on how to maintain proper Cleanliness – Slate/ceramic tiles are easy to spot clean, so it’s very easy to keep their environment clean. They also last forever. Sand and even repti carpet can trap bacteria, it’s very hard to keep their environment clean when those substrate are designed to hide away the mess. Paper towels are often used as a temporary substrate, they work very well since you can simply replace the paper towels when they get dirty. 3. Coziness – Having plenty of hides will allow your leopard gecko to feel safe and secure, which in turn gives them less stress. They can choose where they want to lay in, they can also thermoregulate their own body temperature. This is why there is a warm hide above the under tank heating pad, a cool hide on the opposite side, and a moist-hide somewhere in the middle. You want your gecko to feel comfortable, it’s a place they’ll be living in for a very long time. 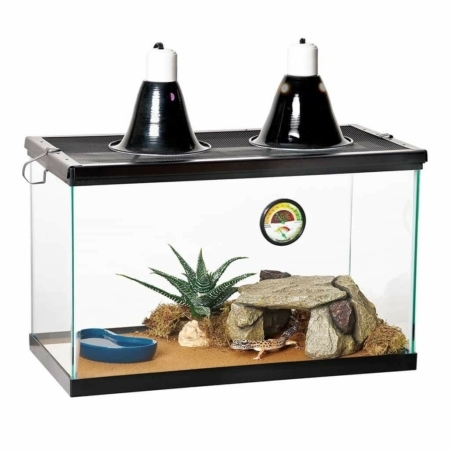 While these tanks won’t be winning any beauty awards (we basically used what we had available at the time), they are designed with leopard gecko’s well-being in mind.